Knock on Wood: Luck, Chance, and the Meaning of Everything is a book about the concept of "luck" in its various senses, including such notions as fate / destiny / karma / superstition / astrology / ESP and more, and how we can avoid "luck traps" to discover the truth -- all from the perspective of a professor of statistics. It was published in Fall 2018 by HarperCollins Canada. See the book's web page at harpercollins.ca or harpercollins.com and a Q&A. It will also be published in Japan by Hayakawa, and in Croatia by Profil Knjiga. The book is available from amazon.ca (or kindle edition), amazon.com (or kindle), indigo.ca, amazon.co.uk (or kindle), amazon.in (or kindle), Barnes & Noble, Walmart, iBooks, UofT Bookstore, and at the Toronto Public Library / ebook [see tweet] and UofT Library. ISBN: 9781443453073. It went on-sale on October 2, 2018, with a book launch on October 4. 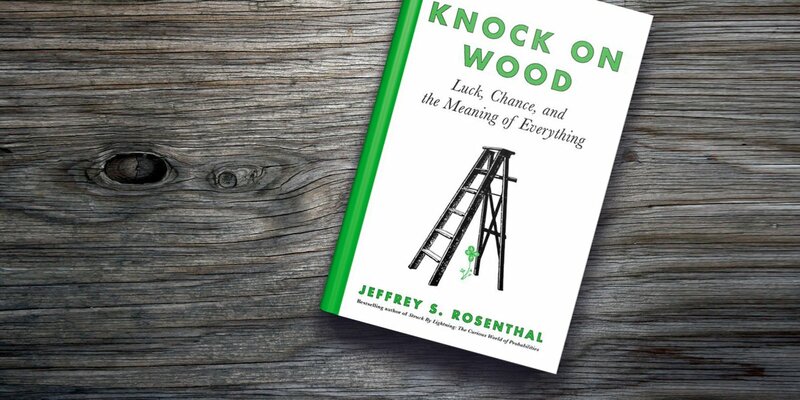 See also the clickable endnotes (pdf), the dust jacket / alt, Knock On Wood on wood, and the publicity activities below, as well as my previous bestselling book Struck by Lightning. And it's initially running 4.67 out of 5 on goodreads.com. I appeared on "Your Morning on CTV" with Ben Mulroney on Tues Oct 2 (2018) at 8:38 am (see photo1, photo2, video1, video2, youtube, mp4), and GlobalTV's "The Morning Show" on Tues Oct 9 at 9:20 am (see video, mp4), and CBC Radio's "The Current" with Anna Maria Tremonti on Tues Oct 9 between 9:30 and 10:00 am [rebroadcast on Dec 31] (see recording and summary, excerpt, mp3, snippet1, snippet2). On Oct 5, I had a Q&A published by U of T (reprinted on phys.org and in Education News), and a related piece published in the Globe and Mail. On Oct 19, I was interviewed on CityTV's Breakfast Television (see video, mp4), plus I recorded some lottery probability answers for Newstalk 1010 radio. On Oct 31 between 11:00 and 12:00 ET (12:00 and 1:00 AT), I did a call-in show on CBC Maritime radio (see audio file beginning at the 11:49 mark). 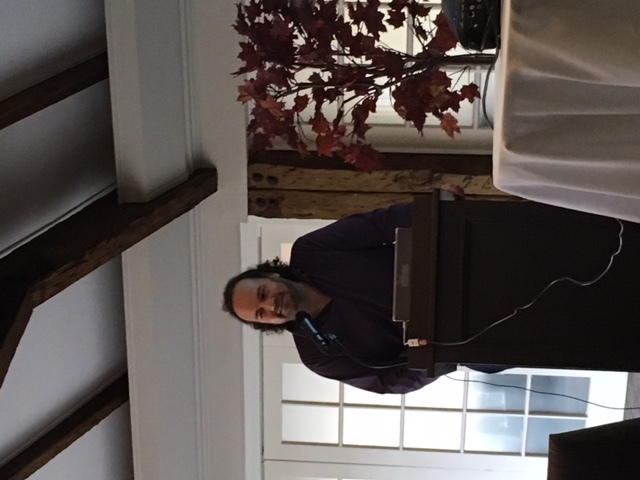 I gave talks about my new book in the university lecture series in Oakville on Oct 29 (see photo), in Markham on Nov 1, and in Toronto's Bloor Cinema on Nov 7 (see photo, audio). On Sat Nov 17 between 2:30 and 3:00, I was interviewed live on JOY 1250 radio in Oakville (see audio, mp3). 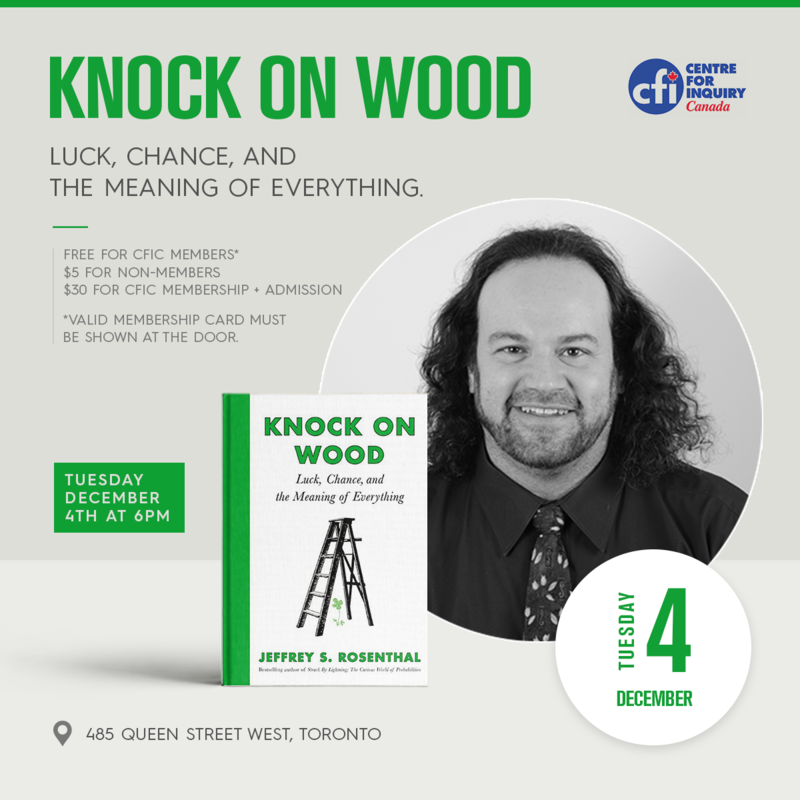 On Tues Dec 4 at 6:15, I gave a talk to CFI Toronto at 485 Queen St W, Toronto (see poster, eventbrite, meetup, Open Book announcement). On Wed Dec 5 at 5:00, I gave a talk at the Rotman School (see Facebook, excerpt, streaming, mp4). 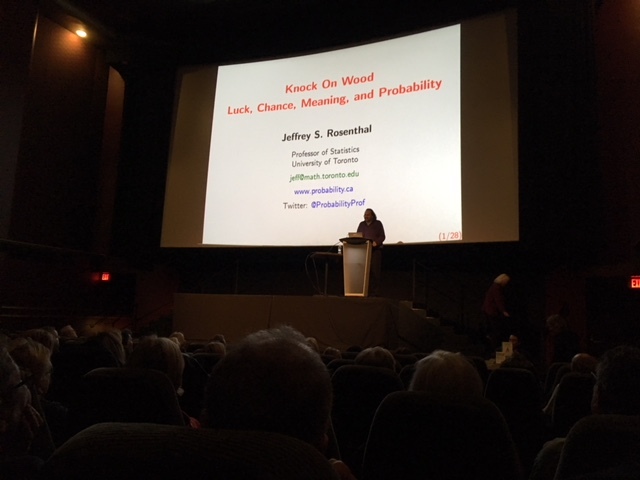 Then on Thurs Dec 6 at 6:30, I gave a public talk about luck for CANSSI in Vancouver (see eventbrite, announcement, video, mp4). The next day, Fri Dec 7, I was interviewed by Global News Morning BC television at 10:15am (see video, mp4), and by The Simi Sara Show (radio) at 12:35pm. In 2019, I will give talks about the book to the Humanist Association of Toronto (HAT) on Sat Jan 12 (see announcement, Facebook), to the Harvard Club of Toronto on Wed Mar 6 (see event), at University of Toronto Senior College on Wed Mar 13 (see announcement), to the Centre for Inquiry Canada in Ottawa on Sun Mar 17 (see eventbrite, meetup, Facebook), at the University of Windsor on Mon Mar 25 (see tweet, poster), to Oraynu on Tues Apr 2 (rescheduled from Feb 12; see event), at CRAM Toronto at 9:00 PM on Fri Apr 5 (see interview), at the 2019 MBNCanada National Forum on Thurs Apr 11, at Brentwood Library on Tues Apr 16, at Northern District Library on Wed Apr 17, to the Halton Peel Humanists on Tues May 14 (see meetup, facebook), at Mississauga Secondary School on Wed May 22, at the U of T Alumni Reunion on Sat June 1, and to the Grey Bruce Humanists on Sun Oct 20. 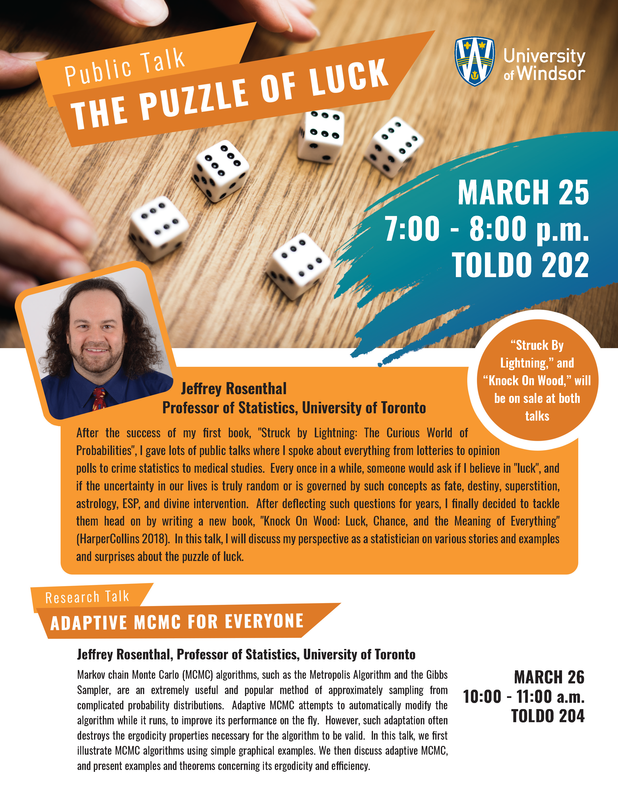 And I did media interviews about lottery probabilities for CBC Kitchener on Jan 12, and CBC Iqaluit on Jan 16, plus interviews about luck and statistics with CBC Windsor on March 26, and with Canadian Atheist on April 12. For further publicity announcements, please follow me on Twitter. 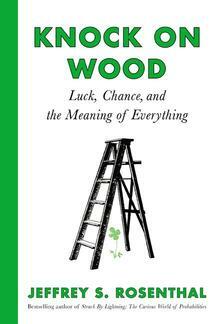 The book Knock on Wood may be ordered from e.g. amazon.ca (or kindle) or amazon.com (or kindle), or from most bookstores. See also Jeffrey Rosenthal's previous book and non-research writings and home page.